The problem with modelling prototype is that some information is difficult to obtain. As the middle section of the Hall Royd layout is private land, there are very few photographs of the private footbridge that crossed the actual junction, and none of the stream that descends the hillside of this point. According to the Ordnance Survey maps, the stream fed a small reservoir above the railway. In the dam wall was a sluice gate, which then fed directly into a stone channel that then took the water down to the railway, and then into a deep level culvert that reappears in the grounds of Lower Laithe House lower down the hillside. 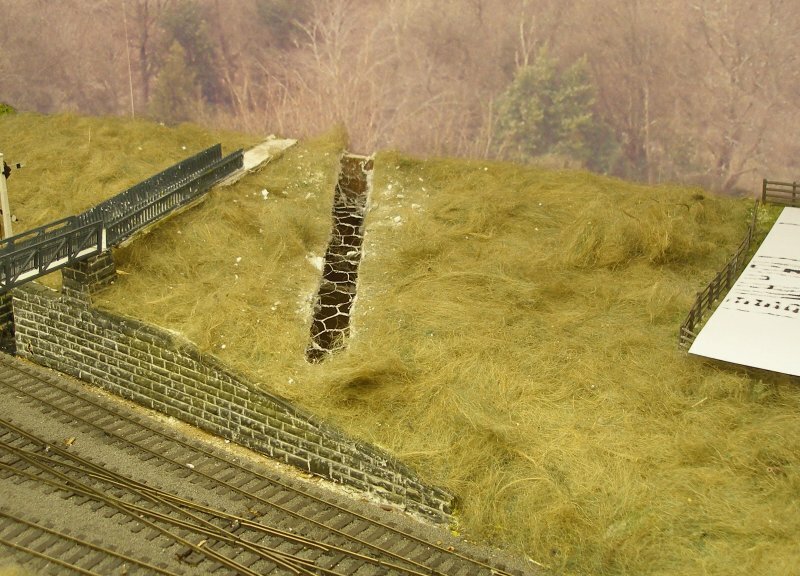 Originally I ignored this feature, as Google Earth showed the site heavily overgrown and the troughing completely covered with vegetation. However Google Earth moves on, and now the users can 'slide'backwards and forwards in time. 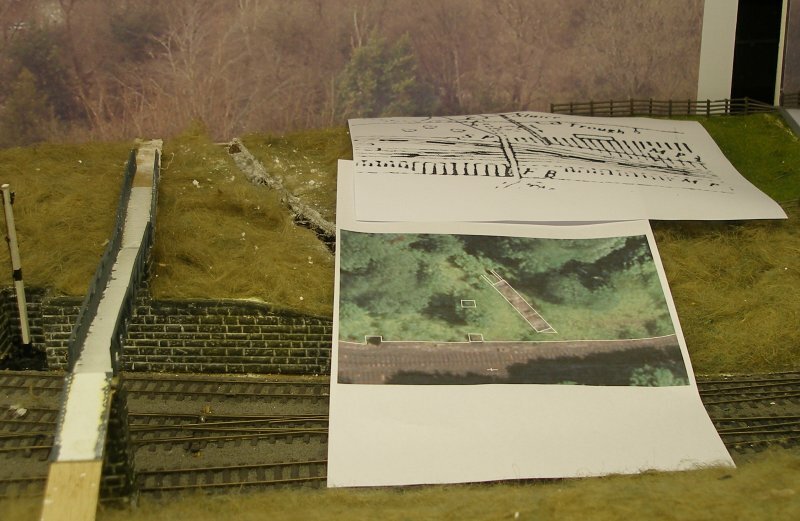 And sometime in 2009 Network Rail decided it needed to clear the overgrowth, and suddenly the previously hidden stone structure was revealed. 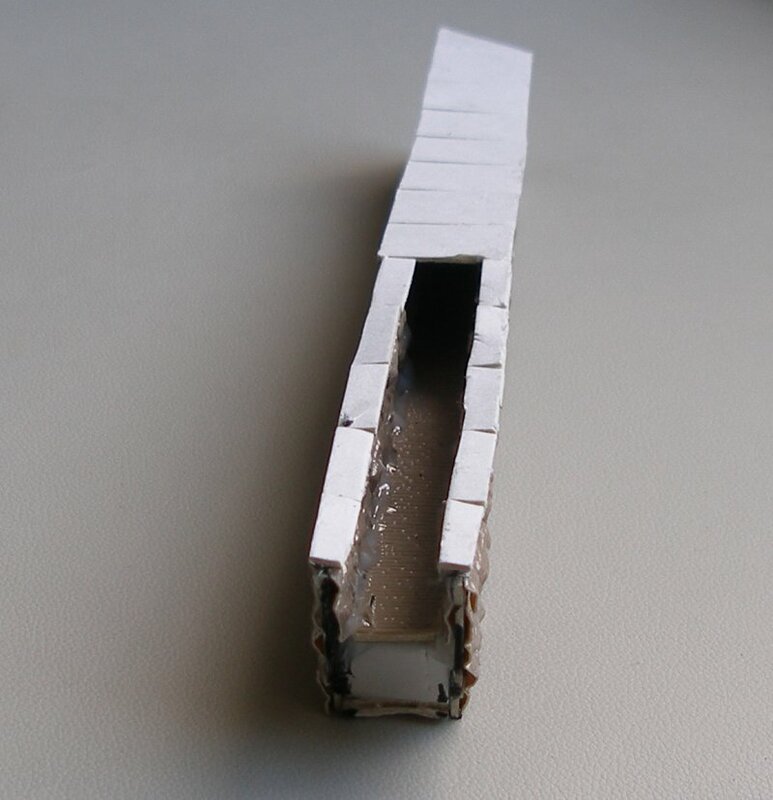 Here is the story of how the trough was installed. The Google Earth image was marked-up to show the location of the trough in relation to the footbridge abutments. Also an extra from a large scale OS map was also consulted. A trench was cut through the Modroc to expose the wirenetting support. 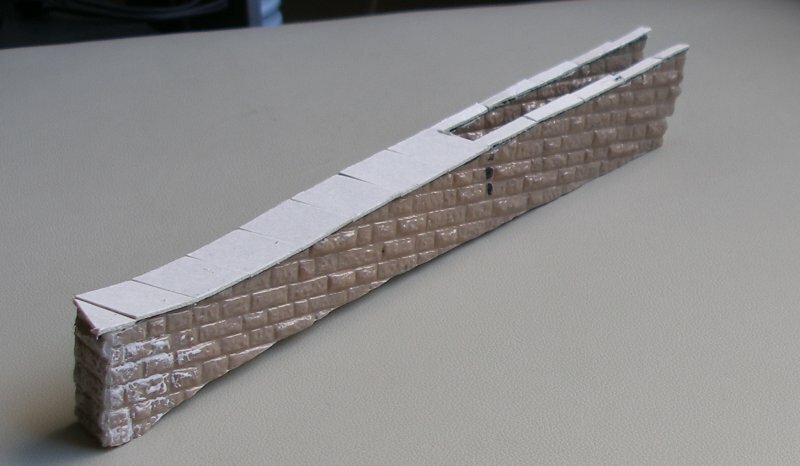 The actual trough structure was made from three pieces of mounting board glued together, and then covered with Slater's 7mm course embossed stone sheet. The floor of the trough uses 2mm stone sheet laid so the stones are at a right angle to the flow of the water - Kiln Clough looking down the water course. Painting is in the style of Geoff Taylor. The whole structure is painted in Humbrol stone No. 68. Once the 'stone' is dry, matt black is rubbed across the surface of the stone work using a finger. Once dry, matt white very diluted with thinners is run along the stone courses. Finally, the finished troughing was dropped into the previously prepared trench. Must be about 17:30 hrs, as the photo below shows the evening empty newspaper vans from Newcastle to Red Bank sidings passing though Hall Royd Junction hauled by an Eastern Region 9F 92085 and Crab 42708. The 9F has provenance, and visitors to the Mevagissey Model Railway may remember the show cases filled with kit built models. These looked very impressive, and 92085 was acquired when the collection was auctioned off on eBay. Although complete, with motors and pick-ups, the locos were never 'runners', and 92085's chassis currently resides on the 'to do' mountain, whilst currently running beautifully on a Hornby Railroad chassis. Anyone with an interest in the Calder Valley line from Manchester up through Rochdale to Todmorden will be aware of the wonderful archive of photos and video shot by Richard Greenwood. One of Richar's photos shows a Crab manfully wheeling the Red Bank empty vans west of Todmorden after the piloting Thomson B1 failed there. This model was a 'scrap' Crab in LMS red, which had sat in the draw as a non-runner for quite some years. As the 9F had power to spare wheeling its 20 parcels vans around the layout, popping the Crab 'inside' as a free-wheeling model seemed a neat way of creating a double header. Richard's photo shows the real loco in intermediate weathered state, so right now it is far too clean. The cotton bud in the foreground tells you that there might have been some wheel cleaning recently. Click here to see how the vegetation and bridge 109 were developed scenically.